It is possible to Import data from excel Sheets direct into the System. This applies to situations where data may already have been entered into Excel files. Involving processing the data and subsequent generation of the analysis report. (iii) The Number of students who scored the mode grade (modal frequency). 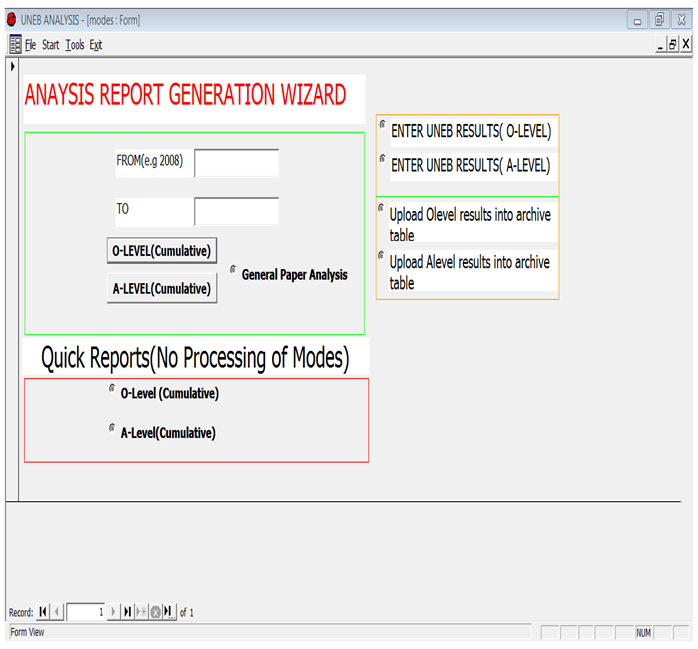 Once processed, the Analysis report can be printed from the appropriate print option. The print out will bear the last processing date and the User who did the processing. If the last processing date is too remote it is advisable to re process before printing Analysis reports. Because of automation , the awarding determination of the weight, the percentage Pass, the Mode and Modal frequency, the Percentage change from one year to another , are done by the Computer automatically . This is a great improvement to the manual system whereby due to fatigue, a teacher could calculate wrong results. The Teachers would be relieved of fatigue, arising out of the manual preparation of the UNEB Analysis.